Ground nutmeg is available prepackaged, but fresh whole nutmeg, that is grated or ground, provides more flavor than the prepackaged variety. 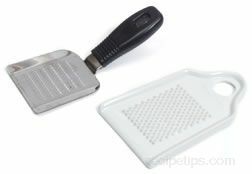 When grating a whole nutmeg, the best tool to use is a special nutmeg grater or grinder. 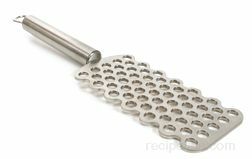 To grate fresh nutmeg, move the whole seed across the fine holes on the grater resulting in coarse particles of nutmeg to be shed. 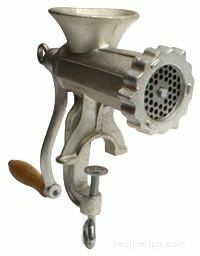 If a nutmeg grinder is used, the grinder contains a chamber that holds the whole nutmeg seed, while a top plate presses against the seed, forcing it down and into a grinding blade. As the seed is rotated in a circular direction, it moves against the blade and is ground into a fine powder. Nutmeg is most often used with sweet or spicy dishes such as pies, custards, puddings, cookies, cakes, and beverages such as milk or egg-based beverages, mulled wine, and punch. 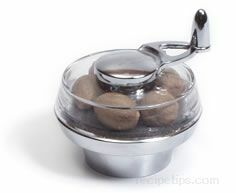 It is also used in soufflés, vegetables, egg dishes, sausages, lamb, and fish.